Abstract. 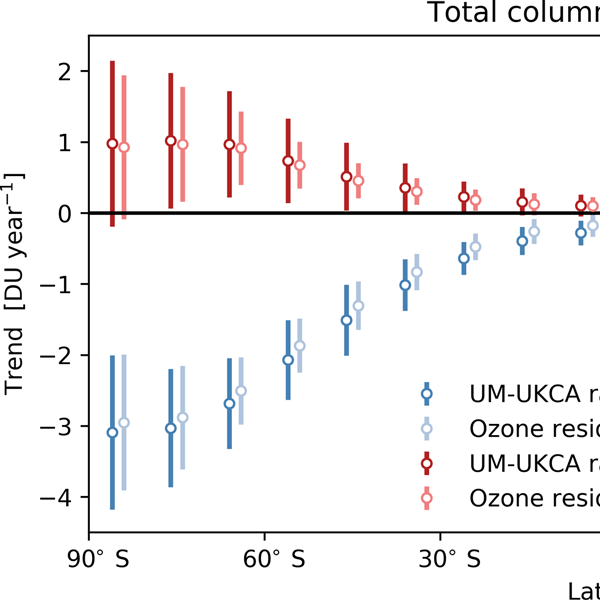 Total column ozone values from an ensemble of UM-UKCA model simulations are examined to investigate different definitions of progress on the road to ozone recovery. The impacts of modelled internal atmospheric variability are accounted for by applying a multiple linear regression model to modelled total column ozone values, and ozone trend analysis is performed on the resulting ozone residuals. Three definitions of recovery are investigated: (i) a slowed rate of decline and the date of minimum column ozone, (ii) the identification of significant positive trends and (iii) a return to historic values. A return to past thresholds is the last state to be achieved. Minimum column ozone values, averaged from 60°S to 60°N, occur between 1990 and 1995 for each ensemble member, driven in part by the solar minimum conditions during the 1990s. 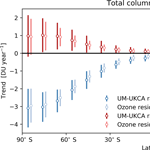 When natural cycles are accounted for, identification of the year of minimum ozone in the resulting ozone residuals is uncertain, with minimum values for each ensemble member occurring at different times between 1992 and 2000. As a result of this large variability, identification of the date of minimum ozone constitutes a poor measure of ozone recovery. Trends for the 2000–2017 period are positive at most latitudes and are statistically significant in the mid-latitudes in both hemispheres when natural cycles are accounted for. This significance results largely from the large sample size of the multi-member ensemble. Significant trends cannot be identified by 2017 at the highest latitudes, due to the large interannual variability in the data, nor in the tropics, due to the small trend magnitude, although it is projected that significant trends may be identified in these regions soon thereafter. While significant positive trends in total column ozone could be identified at all latitudes by ∼ 2030, column ozone values which are lower than the 1980 annual mean can occur in the mid-latitudes until ∼ 2050, and in the tropics and high latitudes deep into the second half of the 21st century. How to cite: Keeble, J., Brown, H., Abraham, N. L., Harris, N. R. P., and Pyle, J. A.: On ozone trend detection: using coupled chemistry–climate simulations to investigate early signs of total column ozone recovery, Atmos. Chem. Phys., 18, 7625-7637, https://doi.org/10.5194/acp-18-7625-2018, 2018. 2017 marks the 30th anniversary of the Montreal Protocol, which was implemented to protect the stratospheric ozone layer from the harmful effects of synthetic ozone depleting substances. Since the late 1990s atmospheric concentrations of these species have begun to decline, and as a result ozone concentrations are expected to increase. In this study we use an ensemble of chemistry–climate simulations to investigate recent ozone trends and search for early signs of ozone recovery.